Home > News > Other Masters > What Makes Bath Master's Students So Employable? What Makes Bath Master's Students So Employable? Thrishya Reddy began her career in visual communication. While working as a web specialist in the design team of a digital marketing agency, she became more interested in client-facing and strategy-oriented roles. So, Thrishya decided to switch career direction and pursue an MSc in Management at Bath School of Management. The University of Bath prides itself on preparing candidates for the job market upon completion of their degrees. In 2016, 100% of Bath MSc in Management students who were looking for a job got one within six months of graduation*. According to research findings published by The Graduate Market this year, Bath ranks in the UK’s top-12 for universities targeted by the largest number of employers. Thrishya chose Bath over two other top-ranked business schools in the UK for her MSc in Management—one of 18 nationalities represented in the class. After graduation, she took up a business development job within the healthcare service industry in India, investing in a fitness brand spread across six cities. “[It] seemed like the perfect way to practically understand every module I studied [at Bath], and use the knowledge I'd gained in the real world,” she says. Elena Kirova, an MSc in Entrepreneurship and Management graduate from Bath, agrees. 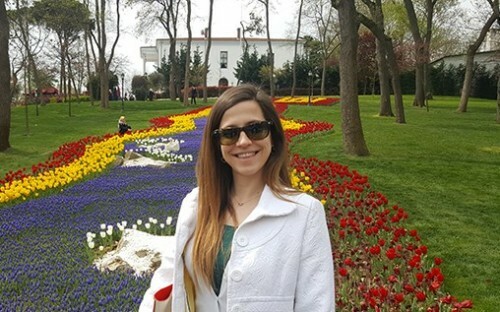 Elena studied finance and advertising for her undergraduate degree, before working with the US Department of Commerce at the American Embassy in Bulgaria. After gaining varied experience in meeting sales targets, expanding customer bases, and ensuring business growth, she decided to take the next step in her career with a Master’s degree. Now, Elena works as a business development associate at Frontier Strategy Group (FSG), a London-based information and advisory services firm for emerging market executives. "I selected Bath School of Management for its high-ranking, not only in the UK but worldwide," Elena explains. “The university is located in one of the safest cities in the UK which features on UNESCO's World Heritage List." Elena says that she was impressed by the lecturers' emphasis on backing up theory with practical industry examples throughout the degree. "We had many guest speakers and this provided first-hand knowledge and profound insights into the nature, potential, and limitations of various business techniques. "I also highly value the international environment at the university," she continues. The international student body, she says, enabled her to create an extensive global network of contacts—a critical element of business in the modern world. Bath’s diverse classes lead to diverse careers too. Out of 2016’s MSc in Management grads, 25% went into marketing; 15% into sales and business development roles; 11% into banking. Companies hiring Bath Master's students include big-name firms like EY, KPMG, Goldman Sachs, and Nestle. On the MSc in Entrepreneurship and Management, students landed jobs at innovative firms like Amazon and even Tencent, China’s Facebook alternative and owner of WhatsApp-like platform WeChat. Bath’s Master’s programs also open up opportunities for non-EU internationals looking for jobs in the UK. As part of a pilot scheme with the UK government, all one-year, full-time Master’s students at Bath benefit from a streamlined visa application process and six months extra time on their visa to look for work. For Elena, it’s simple; her experience at Bath is helping her ace her business development role at FSG. "Studying at Bath School Management, under the guidance of some of the world's leading industry experts, provided me with a first-rank educational experience responding to the business needs of the 21st century," she says. *Employment data based on those looking for work and for whom data is held (81%). Why Should You Do A Master's In Management?